Interested in being a video game achievement hunter? Here are the basics to getting started in achievement hunting. The Nintendo 64 Mini has a lot of potential. But if Nintendo doesn't add the right games, the company could very well screw it up. With plummeting sales and a fanbase becoming more dissatisfied, is it time for Paper Mario -- a once lauded RPG spin-off -- to be put to bed? Go ahead: Slap on a bib and dig in as we take a look at some of the weirdest foods in the RPG world. The Paper Mario series has lost its identity, and it's apparent that it's high time for a return to form. How to get the second (hidden) Mini Paint Star in Plum Park. Simple instructions on how to get the second Mini Paint Star at Chateau Chanterelle. How to find the Thing you need to defeat Iggy in the Golden Coliseum without ripping your hair out. How do you open Kiwano Temple? It's easier than you might think! Beat the Five Fun Guys at their own game in Toad Shuffle. Paper Mario on the N64 and Paper Mario: The Thousand-Year Door might be paper thin, but they're far from two-dimensional. Can Color Splash learn from the mistakes of Sticker Star and be a much better game? According to IGN, Nintendo has announced that Paper Mario: Sticker Star will release for Wii U on October 7. Mario's distinctly flatter form is back for a rainbow romp on Wii U - and it looks mighty familiar. Super Mario Bros is one of the most popular video games of all time. Unfortunately, the game makers seem to forget half of their audience most of the time: women. Today Club Nintendo's North America branch shuts down, leaving Nintendo fans distraught. JRPGs might be a declining genre, but Paper Mario will always be there to guide us in our time of need. 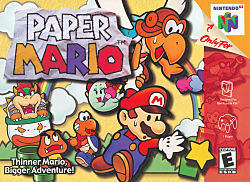 No one has reviewed Paper Mario yet! Played Paper Mario yet? What did you think?